Guess Rigor W0247G3 to niezawodny i atrakcyjny zegarek męski. Materiał, z którego wykonana jest koperta to stal nierdzewna, a granatowy kolor tarczy nadaje zegarkowi jeszcze większego charakteru. Zegarek wyposażony jest, między innymi, w funkcję daty. Jeżeli chodzi o wodoszczelność, zegarek jest odporny do 100 metrów. Oznacza to iż jest zbudowany z myślą o pływaniu i pytkim nurkowaniu. Zegarek jest wysyłany z 2-letnią grawancją i oryginalnym opakowaniem od producenta. Beautiful looking eye catching, waterproof designer watch. Very comfortable strap. One of the beautiful classy slick watch. I definitely suggest to buy it.. Worth its price. Plus watch shop do a good job to bring your watch to you quickly and in proper order. 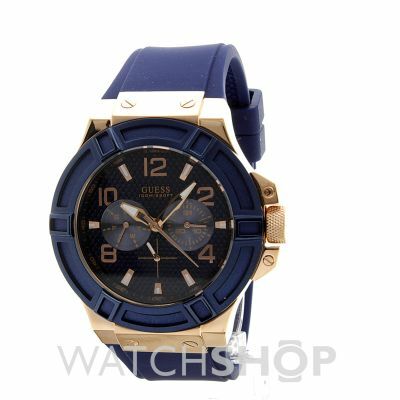 This Guess watch is very stylish and well proportioned for a mans watch. 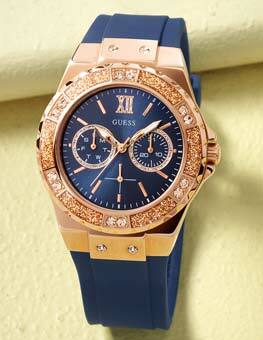 The rose gold detail is set off perfectly by the denim blue face and strap. Certainly a statement watch and perfect for a Valentines present for my designer husband. Very attractive watch. Easy to read the dial. A bit fiddly to set the date but overall a great watch at a great price! Excellent watch, love the rose gold colour. A no hassle purchase and will buy from here again. The watch was bought as a gift, which went down very well. 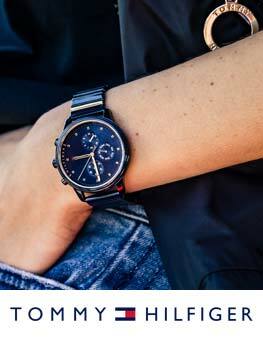 It was bought as a more casual watch for wearing on less formal nights out, as well as occasional daytime events. The watch exterior finish is solid and sturdy in appearance, and the colours work well together, although it certainly is not a discreet watch! The face of the watch is again well finished, and appears to work well with the overall watch design. It should be noted that there is a good weight to the watch, and would be what I would normally have expected in an even more expensive model. Overall, the watch was a great purchase, and I would highly recommend it for anyone looking for a slightly more bling watch for those less formal nights out. I have had the product gift wrapped so I have not had chance to see it itself however i was dissapointed by the personalised tag as it was just a sticker that was stuck on really unprofessionally. The watch boasts a stunning combination of a gold like colour and a beautiful blue. Not as heavy as youd expect it to be. 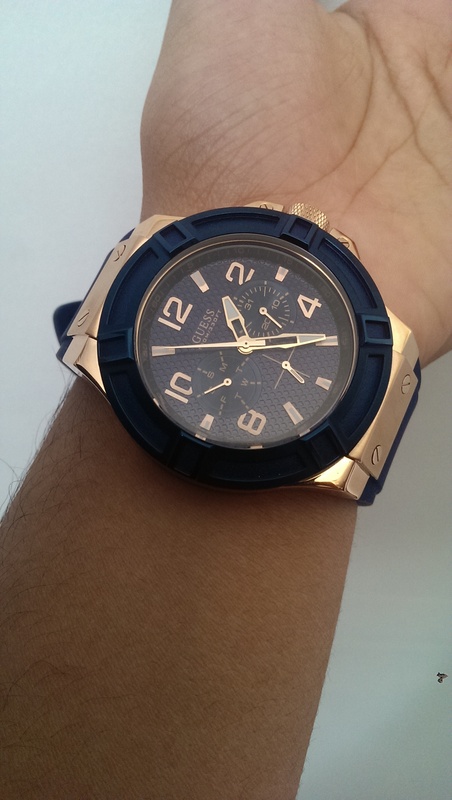 I chose it as a gift for me and it really stood out amongst all the other watches. So stylish and goes well with pretty much everything. Bought the watch to have as an additional option to wear to work, but its such a great looking watch I now wear it all the time. Great design and colour! Sleek. Stylish. Sophisticated. Smart and classy. Looks even better in real life than in the photos. The deep navy colour is entrancing and tied with the rose gold the piece makes for a fantastic accessory as well as a reliable timekeeper. It does exactly what its supposed to and the face is just perfect. Only improvement I could suggest is perhaps a different material strap. The silicon is great but Id prefer a cool surface against my skin at times. The watch absolutely stunning, brought it to wear along my an blue suit for wedding, the colour was vibrant, the built quality was good and it perfectly complimented each other, everyone was stunned by the whole look it created. Hi second time of buying from both times great experience every think as said and smoothly packaged well, will def buy again from you guys. Brilliant price, great delivery time and order tracking. Product looked great and was exactly as ordered. Excellent watch and service ! Arrived on time and very well prepared for shipping so watch and box in perfect condition on arrival ! 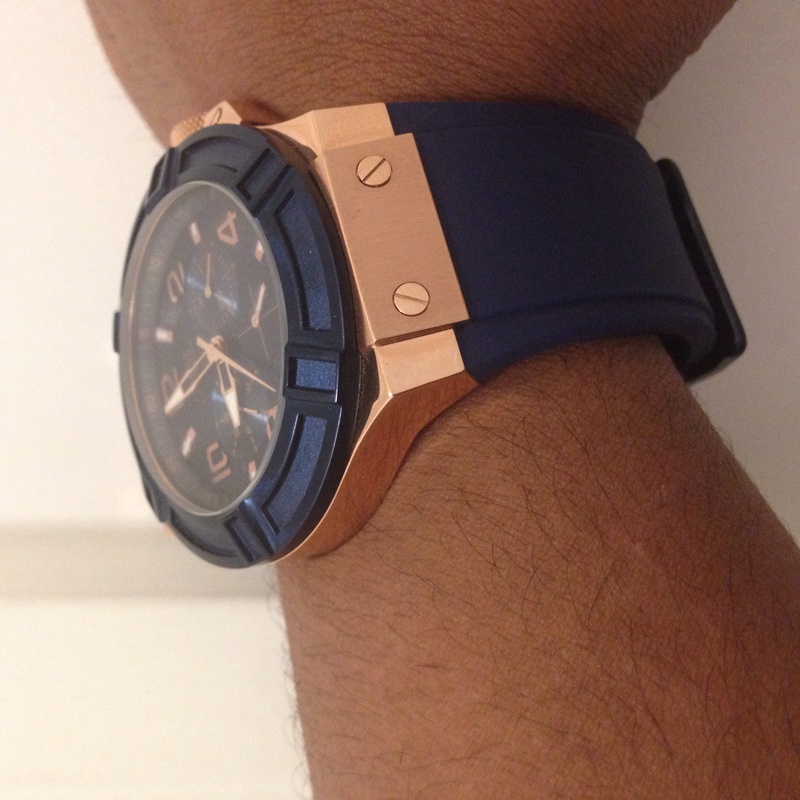 Really nice navy watch and works well with the rose gold ! Great price and on trend ! This Guess watch was a present for my boyfriend. He loved the watch as it was different compared to most watches. The rose gold & the rubber strap was perfect for him. 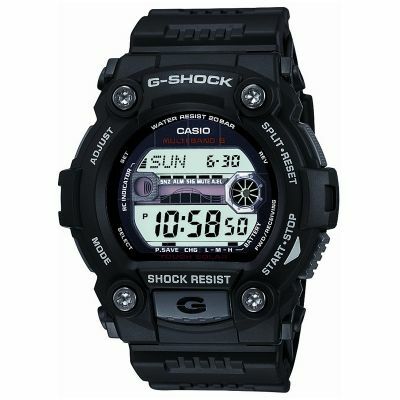 I would definitely recommend this watch as it is very good looking & catches a lot of eyes. Brought This Watch For My Boyfriend. As Soon As I Saw It Online, I Was Drawn To It. 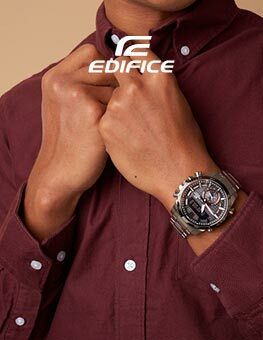 The Watch Is Fablous Both Good For Casual & Smart Wear. 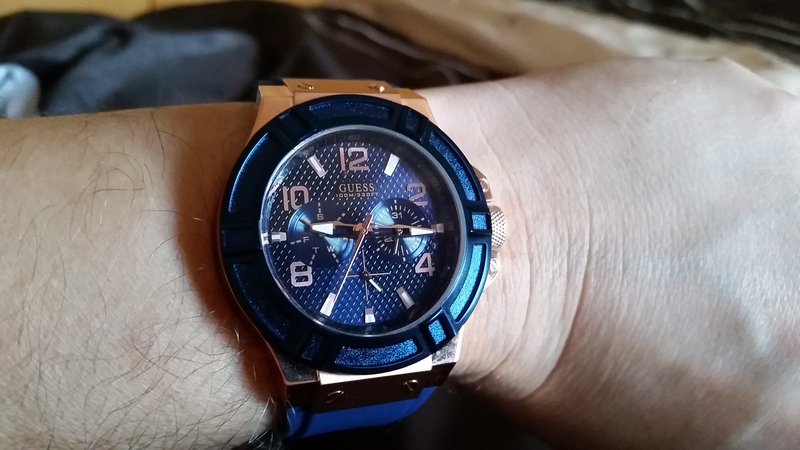 Very smart and stylish watch, looks as did online and couldnt be happier with my purchase. Is a Christmas present for my husband and am positive he will love it. Super fast and efficient delivery. This mans guess watch was bought for my 20yr old son. It arrived super quick in immaculate packaging and just as it was seen online. The watch is fantastic looking, fantastic quality at a fantastic price. Im delighted with the service, and my son is more than delighted with his gift. Thank you watch shop. Im already checking out a new purchase. I will definitely use you again and again! Loved the watch, very stylish. Partner will love his christmas present. Excellent choice off colour too, it looks great. Great watch. Immediately noticed by a number of friends on a night out who were all very complimentary. The look far outstrips the price. I saw this watch online on many sites and instantly thought my 24 yr old boyfriend would love this. The color combination is amazing and the watch actually looks better then the images show. My bf has never had a rubber strap watch but I think this watch will make him think otherwise. I think this is a perfect present to give which is priced at a good value. Its also waterproof which is helpful. It goes well with a professional suit for work and looks amazing in casual wear too!!! Never had a Guess watch before but do recommend it. Marka Guess powstała w 1981 roku w Beverly Hills i prawie od samego początku stała się jedną z najbardziej popularnych i modnych lini odzieżowych na świecie. Swoją przygodę z zegarkami Guess rozpoczął w 1984 roku i dzięki wysokiej jakości mechanizmom kwarcowym oraz ekstrawaganckim i modnym stylom swoich czasomierzy marka odrazu znalazła sie w czołówce producentów zegarków. Guess podążając za najnowszymi trendami w świecie mody produkuje zegarki dla obu płci, a ich oferta waha się od eleganckich czasomierzy z metali szlachetnych do ekscentrycznych, funky zegarków w kolorowym stylu. 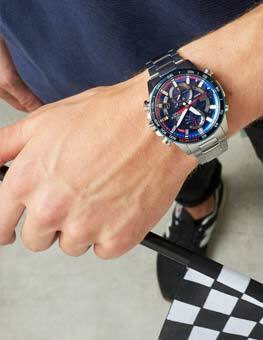 W naszej kolekcji znajdziesz najnowższą generację zegarków Guess Connect Smartwatch, dzięki którym bedziesz mógł pozostać w kontakcie i komunikować sie w wielkim stylu. Watch Shop jest oficjalnym detalistą Guess.